social media – Technology… in PLAIN ENGLISH! If a stream is live, it’ll say “LIVE” (in a bright color) above your friend’s name in the Stories row. This is true for both Facebook and for Instagram. I like this because there’s no confusion. If there’s a replay of a livestream, it’ll show up as a replay button in a vivid color above your friend’s name also in the Stories row. Update: There’s no more FB Messenger Day but find Dana Garrison on social media and follow her anyway! Facebook has always made it easy for you to tell whether a live video is truly live or after the fact or scheduled to broadcast. Just look at the words next to the person’s name. 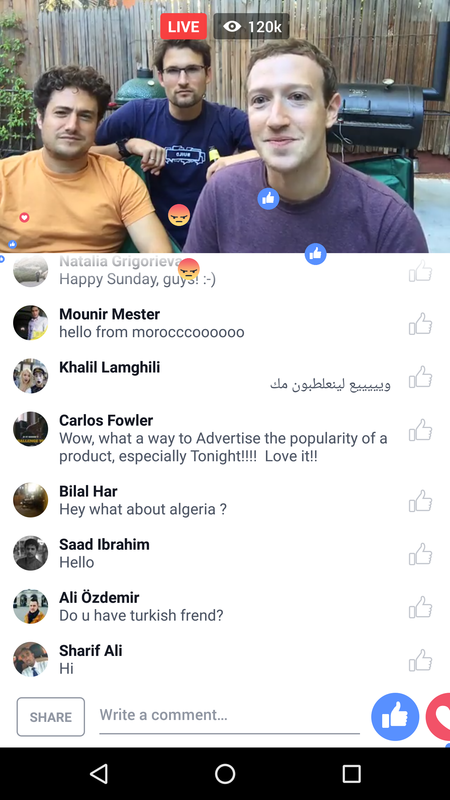 Did you see Mark Zuckerberg’s “Grill Talk” just now on Facebook Live? Funny thing is, I don’t remember the name of the sauce. If I really wanted to know, I’d need to watch Mark’s replay, or perhaps wait for it to be mentioned (again, organically) on his next “Grill Talk”, which probably should’ve been named “Chill And Grill”. There wasn’t a ton of grilling discussion, and that wasn’t the point anyway, just Mark saying “Hi Cambodia, hi Shanghai” etc. and showing his child, wife, friends and Hungarian sheepdog named “Beast”. So back to the sauce and how I don’t remember the name, well, that’s how it should be. Organic word of mouth. If, over time, a product gains traction and mass appeal, then it’s destiny, I guess. Overall it really was nice to just observe Mark in his yard with close friends and family on a weekend. Better than watching Trump vs. Clinton, although that’s what he said the barbecue was for, to eat barbecue and watch the debates. Oh, I get it now. Grill, debate, haha. Cute wordplay. Are you using Facebook Live yet? If not, why not? Tip: If you’re a guest a lot, keep everything together on one page. Click on this link (Social Butterfly) or on the image below to visit my special “as a guest” page. Why is having one central page for this a good idea? Because ultimately it’s a time-saver, neater and courteous to your visitors. Oh hey ~ Click this link: ctt.ec/o61pH It’ll tweet this page. Be logged into Twitter first, though.